In my last newsletter, I told you about the phrase which has served as an overriding theme for our 10th anniversary: “A creative adult is a child who survived” – a phrase which has become our mantra. Well, if there’s one creation this year which plays the part perfectly, it has got to be our friend “Melchior”! First unveiled at Baselworld this year, Melchior was an instant hit – among other reasons because he offered something refreshingly different at a fair 99% devoted to wristwatches. He has gone on to become one of the stars of this year, and now proudly stands guard at clients’ homes and offices around the world. 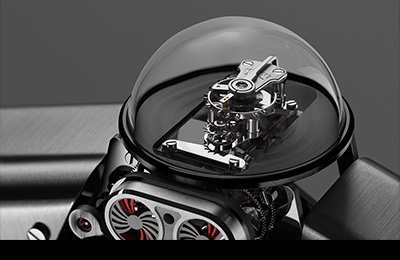 In case you missed the announcement, Melchior was conceived and designed by MB&F, together with Chinese designer Xin Wang. 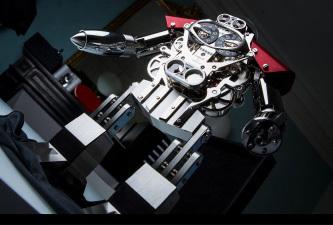 The engineering and manufacturing are the works of L’Épée 1839, Switzerland's only specialised high-end clock manufacture – with whom we created the Starfleet Machine last year. 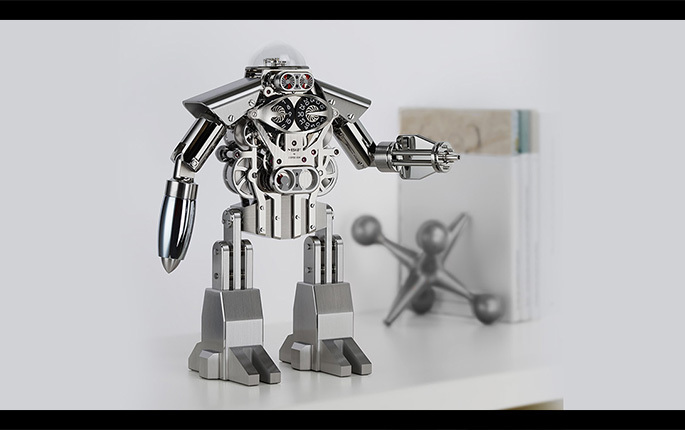 The result is an impressive, 30-cm tall kinetic robot coming straight from our childhood dreams, but also a beautifully finished, 480-component mechanical table clock. 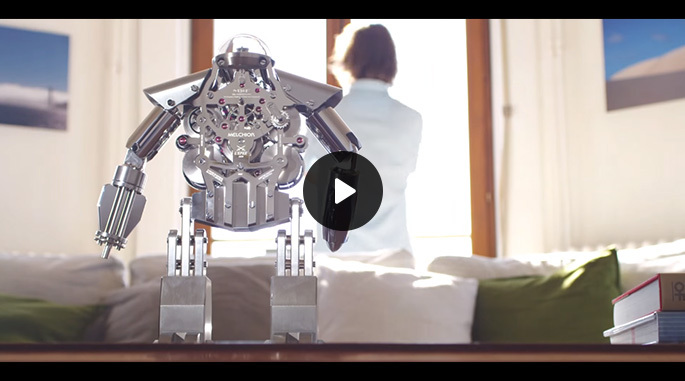 Melchior has the traits of the robot buddy we hoped for as kids: smart steel and brass armour, enigmatic glint in his eyes, animated brain and muscular, articulated arms. On the technical side, you’ll note the “slow” jumping hours, sweeping minutes, double retrograde-second eyes… and an amazing 40-day power reserve! Yes, while most conventional table clocks deliver 8 days, Melchior will keep ticking for well over a month, thanks to five powerful barrels. 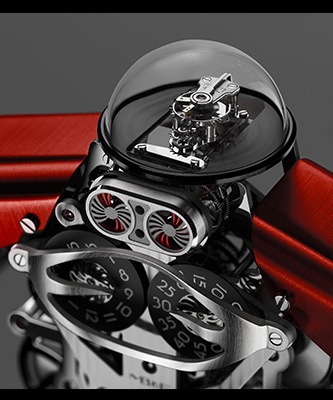 Looking more closely at his head, you’ll notice his brain – the balance wheel and regulating system – which is fully visible thanks to his polished glass skull. You’ll certainly also notice his expressive eyes: retrograde discs make Melchior wink every 20 seconds, giving him a human-like personality. Have a look at the video to see all this in action. 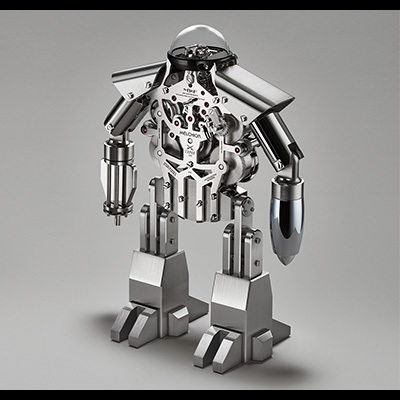 Melchior’s steel upper arms rotate and his lower arms pivot up and down – offering excellent manoeuvrability for aiming his rocket launcher and Gatling gun. We’ve also solved a recurring problem with table clocks: the winding key always gets lost. Melchior’s winding key is his Gatling gun! Now you may ask, why “Melchior”? The answer is a family tradition: for over five centuries, from the 1400s onwards, every eldest Büsser son was either called Melchior or Balthazar. My grandfather was called Melchior… and he disliked it, so he had everybody call him Max, which is how I got my name. He also stopped the tradition by calling my father Mario, but time has now come to bring back a Melchior in the Büsser family! Melchior is limited to 99 pieces, in either monochromatic ‘light’ or two-tone ‘dark and light’ editions. There are a few pieces left at some of our retail partners around the world… but there’s also a final piece which will be up for sale very soon: keep reading! The 100th and final piece in the Melchior series is a piece unique: Melchior ‘Only Watch’, created especially for the famous charity auction. This unique piece is instantly recognisable thanks to his bright red shoulder armour – an additional tribute to the beloved toys from our childhood. To see Melchior ‘Only Watch’ in detail, I recommend having a look at the live shots captured by Haute Time a few weeks ago. If you’re not familiar with Only Watch, this will be the sixth edition of a biennial auction of unique timepieces, held under the High Patronage of HSH Prince Albert II of Monaco. The mission: to raise money for research on a terrible disease, Duchenne Muscular Dystrophy (DMD) – a genetic disorder characterized by progressive muscle degeneration affecting young children, mainly boys. We contributed unique pieces to Only Watch twice in the past: first in 2009 with a unique HM2, co-created with Californian artist Sage Vaughn; and then again in 2011 with a “flying panda” HM4, created with Huang Hankang, a Chinese artist based in Paris. For this year’s edition, Only Watch brings together 44 of the world’s greatest watch brands; 44 unique pieces which will be put to auction this Saturday, November 7th, at 3:00 pm Geneva time. Phillips are managing the auction, in association with superstar Aurel Bacs of Bacs & Russo. If you want a unique Melchior and want to do good while you’re at it, I urge you to participate in the auction. You can either attend the event at La Réserve in Geneva, or bid online – all details can be found here. This is a busy week… Tomorrow, Tuesday November 3rd, we launch a new Legacy Machine! The new piece follows in the footsteps of LM1, LM2 and LM101 – so you can expect a Machine which once again pays tribute to traditional watchmaking, but featuring an entirely new movement, created from scratch with a new Friend. 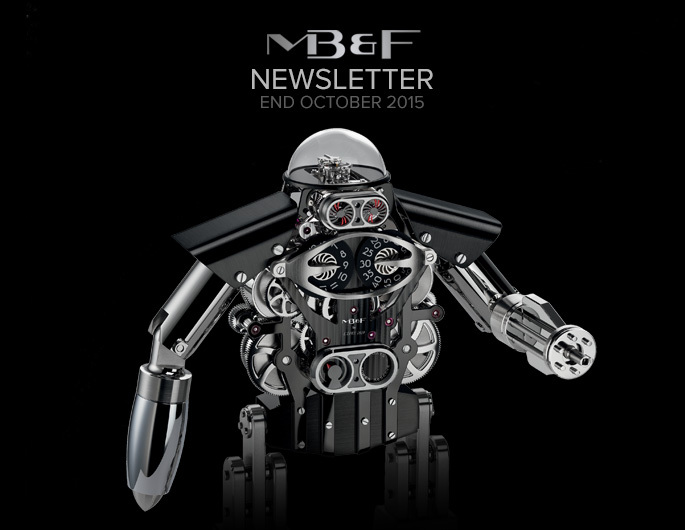 In fact, this new Machine will contain a complication we’ve never tackled before at MB&F! The piece launches at 13:00 Geneva time (CET). If you’d like to be among the first worldwide to see it, log in to our social media accounts: our Facebook and Instagram pages will be the first to break the news. If we didn’t see you in Taipei, Mumbai, Dubai or Mexico City this month, we’ll have another occasion at Salon QP in London, on November 12-14 – where the new Legacy Machine will be making one of its first public appearances. Hope to see you soon – as always, do stay in touch!